A no-passport needed Caribbean getaway with lots of cultural flair—it's easy to see why Puerto Rico honeymoons are so popular. Puerto Rico may be part of the US, but a Puerto Rico honeymoon here is nothing like staying at home. The island—and three offshore counterparts Vieques, Culebra, and Mona—offer a culture all their own, in a tropical paradise fit a romantic getaway. While much of Puerto Rico was heavily damaged in the 2017 Hurricane Maria, there is still plenty of life and romance to be found on the island. You’ll find a bit of everything in this diverse territory. For nature lovers, there are secluded beaches, rainforest excursions, and wildlife preserves. You can visit El Yunque National Park, or kayak the glittering waters of the a bioluminescent bay. For city dwellers, there are high-rises, luxe hotels, and casinos to boot. And for everyone else, there is loads of historical culture, charming seaside villages, and plenty of delicious food, from Old San Juan to Parque de Bambas. That’s, of course, not to mention the liveliness of the culture itself. Locals love to celebrate life with dancing and carnivals. This island is proud of its Spanish heritage, full of joy, and Puerto Rico honeymoons are loaded with plenty of romance. 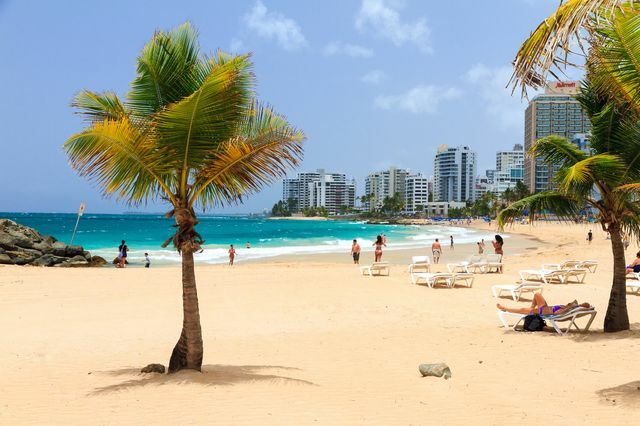 Temperatures rarely dip below 80 degrees in this tropical paradise, but the best time for a Puerto Rico honeymoon is mid-April through May, when the bustling tourism surrounding the winter months and summer vacation begin to lull. Prices stabilize at this time, so you won’t be paying high holiday surcharges. Avoid June through November, which is typically hurricane season for the island. Take a historical tour of Old San Juan: Walk the cobblestone streets of this walled UNESCO World Heritage site, originally built in 1521 and one of the best-preserved Spanish colonial sites. Visit El Yunque: One of 20 forest reserves on the island, the biggest, El Yunque, is 28,000 acres and full of lush greenery, La Mina waterfall, and even a spot to grab a delicious burger. Grab a night cap at Grand Beach’s Martini’s Nightclub: Enjoy a drink, some salsa dancing, and if you’re feeling lucky, a few games at the casino. Take a food tour: Foodie couples will love exploring the island’s authentic dishes from plantains and sofrito to flan and local-made rum during their Puerto Rico honeymoon. People watch at La Concha Lobby Bar: Grab a trendy cocktail and watch as this lobby swarms with revelers enjoying DJs and live music. See where the oceans meet: The Atlantic and Caribbean Sea meet at Fajardo, take in the view from the 300-foot cliff at Conquistador Resort. Sip the original Pina Colada at Restaurant Barrachina: The pina colada was invented here in 1963, and the original may be the best you’ve ever tasted. Find privacy on La Chiva: This super-remote beach on Vieques was once used for bombing practice by the Navy. Now, it’s a secluded hot spot for romantics—and an ideal spot to visit during a Puerto Rico honeymoon. Zip-line under the stars: Acampa adventures in Mucaro takes you on a high-flying night tour above the treetops, then finishes the excursion with a traditional stew dinner, beer, and music around the campfire. We’re spending a week in Puerto Rico for our honeymoon! Any recommendations for things to do and places to stay?